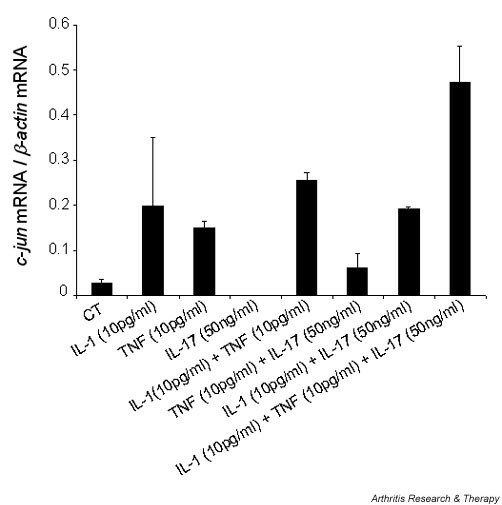 To determine the contribution of IL-1β, tumor necrosis factor alpha (TNF-α) and IL-17 to AP-1, NF-κB and Egr-1 activation in rheumatoid arthritis, the effect of the cytokines used alone or in combination was measured on TF expression in rheumatoid synoviocytes. Effects on mRNA expression were measured by RT-PCR and effects on nuclear translocation were measured by immunocytochemistry. To assess the functional consequences of cytokine induction, osteoprotegerin levels were measured in synoviocyte supernatants. IL-1β and TNF-α alone at optimal concentration (100 pg/ml) induced the nuclear translocation of NF-κB and almost all AP-1 members, except JunB and Egr-1 for IL-1β and except Fra-2 and Egr-1 for TNF-α. IL-17 was clearly less potent since no nuclear translocation was observed, except for a weak activation of Fra-1 and NF-κB. More importantly, when these cytokines were used at low concentrations, their combination showed a synergistic effect on almost all the TFs, except for Egr-1, with a particular effect on Fra-1 and NF-κB. Increased recruitment of additional factors was induced when the three cytokines were combined. IL-1 and TNF-α induced mRNA expression of c-jun while IL-17 had no effect. A synergistic effect was seen with their combination. A similar synergistic effect was observed for osteoprotegerin production when these three cytokines were combined at low concentrations. AP-1 and NF-κB pathways were highly sensitive to the combination through synergistic mechanisms. These effects observed in rheumatoid arthritis synoviocytes may reflect the conditions found in the rheumatoid arthritis joint and may contribute to the mode of action of cytokine inhibitors. Rheumatoid arthritis (RA) is a chronic inflammatory disease characterized by the infiltration of the synovial membrane with monocytes/T cells, by the proliferation of synovial lining cells and by the production of proinflammatory cytokines, which contribute to cartilage and bone destruction. Recent therapeutic interventions with tumor necrosis factor alpha (TNF-α) and IL-1 inhibitors strongly support the importance of cytokines in RA. These cytokines are key activators of the TFs AP-1, Egr-1 and NF-κB. Binding sites for these TFs have been identified in the promoter regions of several inflammatory genes such as IL-6 and IL-8 [1, 2]. Activation of the NF-κB/Rel transcription family and AP-1 complexes, composed of members of the Jun and Fos families, contributes to RA-associated inflammation . The zinc finger factor, Egr-1, plays a critical role in bone resorption, and elevated levels of egr-1 mRNA were found in RA synoviocytes . Recent information regarding the contribution of cytokines from T cells has emerged from results with IL-17 . This cytokine is produced by activated T cells and has been found in RA synovium . Less is known about the molecular signaling mechanisms induced by IL-17. Like IL-1β and TNF-α, IL-17 activates NF-κB and AP-1 in human fibroblasts . Furthermore, a combination of IL-1β or TNF-α with IL-17 was found to be synergistic in synoviocytes [8–10], in bone stromal cells , in bone and in meniscus explants [12–14]. Many studies have considered these cytokines acting alone at concentrations that may not be achieved in vivo. Conversely, in diseases such as RA, cytokines are present in combination but at lower concentrations. Accordingly, understanding of such synergistic activation is critical as this may lead to new therapeutic applications. To determine the contribution of TFs in the pathogenesis of RA, we evaluated the expression and function of AP-1, NF-κB and Egr-1 in human RA synoviocytes by RT-PCR and by immunocytochemistry after induction with IL-1, TNF-α and IL-17 alone and in combination. To assess the functional consequences of these conditions, osteoprotegerin (OPG) levels were measured in synoviocyte supernatants. The present study indicated that optimal concentrations of IL-1 and TNF-α induced most of these factors, while IL-17 had a weak effect. The combination of low concentrations of these cytokines, however, was able to induce synergistic effects associated with the recruitment of additional factors not induced by individual cytokines at the same concentration. The same conclusion was observed at the protein level. RPMI 1640, FCS, L-glutamin, antibiotics, Trypsin–EDTA, Hoechst H33258, orthophenylenediamine and other products for cell culture were from Sigma (St Quentin Fallavier, France). Primary polyclonal and secondary FITC-conjugated antibodies were from Santa Cruz Biotechnology Inc. (Santa Cruz, CA, USA). IL-1β, TNF-α and IL-17 were from Sigma. Trizol® Reagent, Superscript II™ Reverse Transcriptase and Platinum® Taq DNA Polymerase were from Invitrogen (Cergy Pontoise, France). The primers were obtained from Eurobio (Les Ulis, France). Antihuman OPG monoclonal antibody MAB8051, recombinant human OPG/Fc chimera 805-OS and biotinylated goat IgG antihuman OPG antibody (BAF805) were obtained from R&D systems (Abingdon, UK). Rheumatoid synovium samples were obtained from patients with RA, according to the revised criteria of the American College of Rheumatology , who were undergoing synovectomy and/or joint replacement. Briefly, synovium samples were cut into small pieces and digested with 1 mg/ml collagenase and DNase in RPMI 1640 for 2 hours at 37°C to isolate synoviocytes. After centrifugation, cells were suspended in complete RPMI 1640 medium supplemented with 10% FCS, 2 mM L-glutamin and 1% (v/v) antibiotics mixture (10,000 U penicillin and 10 mg streptomycin) and were cultured in 100 mm culture petri dishes. At confluence, cells were trypsinized and passaged. Cells were grown in 75 cm2 flasks in completed RPMI 1640. Cells were plated at a density of 1 × 104 cells/cm2 onto glass coverslips (diameter, 12 mm). When subconfluent, cells were deprived of FCS for 12 hours and then were stimulated either with IL-1β, TNF-α or IL-17, or with combinations of these cytokines. Immunofluorescence staining was performed on control and stimulated rheumatoid synoviocytes (i.e. before and 30 min after cytokine addition). After removal of the culture medium, cells were fixed overnight at 4°C with 4% paraformadehyde and washed intensively (3 × 5 min) with 1 × PBS. Cells were then permeabilized for 3 min in 0.1% Triton X-100/1 × PBS, followed by three washings. Non-specific binding was abolished by incubation for 1 hour at room temperature in blockade solution (1 × PBS, 0.1% bovine serum albumin). Polyclonal primary antibodies (anti-AP-1, anti-Egr-1 and anti-p65 NF-κB), diluted 1:100, were added for 1 hour at room temperature and the cells were washed again in PBS. Samples were then incubated at room temperature for 1 hour in blockade solution. Afterwards, cells were washed in PBS and incubated with polyclonal secondary FITC-conjugated antibodies (diluted 1:100) for 1 hour at room temperature. Cells were then washed in PBS and incubated for 30 min at room temperature with 0.5 μg/ml Hoechst H33258. After PBS washings, samples were mounted in PBS/glycerol 80%. Nuclear translocations were confirmed by nuclear staining with Hoechst H33258. Image acquisition was performed with a fluorescence microscope (Leica, Paris, France) coupled to a video camera (Nikon, Champigny, France). The mean green intensity of the nuclear staining was quantified with Lucia® image analysis software in 10 randomly selected cells. RNA extraction was performed with control and stimulated RA synoviocytes before and 20 min after cytokine addition. Total RNA was isolated by guanidium isothiocyanate extraction using Trizol® reagent. Briefly, the samples were disrupted in lysis buffer, separated into a phenol–chloroform phase and precipitated. Pellets were dissolved into RNAse-free water. Total RNA was quantitated using the SmartSpec™3000 (Bio-Rad, Marnes la Coquette, France). The integrity of RNA was checked by loading 1 μg (based on OD260) per lane on 1% agarose–1 × TAE gel, separated by electrophoresis. Equal loading of the RNA was confirmed by ethidium bromide staining. One to three micrograms of total RNA were reverse-transcribed into single-strand cDNA using 25 μg/ml oligo(dT)12–18 primer, 0.5 mM each dNTP, 40 U/μl RNase Out™ inhibitor, 0.01 M dithiothreitol and 10 U/μl Superscript II™ reverse transcriptase in the first strand. The reaction was incubated for 50 min at 42°C and for 15 min at 70°C. The single-strand cDNA was then diluted and samples were amplified using Platinum® Taq DNA Polymerase (Invitrogen) in a 50 μl PCR mixture containing (20 mM Tris–HCl and 50 mM KCl) PCR buffer with 1.5 mM MgCl2, 0.2 μM 5' and 3' oligo-primers, 0.2 mM each dNTP and 2.5 U Platinum® Taq DNA Polymerase. Amplification reactions were performed in a thermal cycler (Gene Amp® PCR System 9700 Biosystems; Perkin Elmer, Courtaboeuf, France). The cycle number was optimized to examine the relative expression of each of the RT-PCR products within their linear range of amplification. The oligonucleotide primer sequences were as follows: for c-jun, the forward primer was 5'-GGA AAC GAC CTT CTA TGA CGA TGC CCT CAA-3' and the downward primer was 5'-GAA CCC CTC CTG CTC ATC TGT CAC GTT CTT-3' ; for β-actin, the forward primer was 5'-GGG TCA GAA GGA TTC CTA TG-3' and the downward primer was 5'-CTC CTT AAT GTC ACG CAC GAT TTC-3'. The housekeeping gene β-actin was amplified as an internal control. PCR fragments were analyzed by electrophoresis on 1% agarose–1 × TAE gel containing ethidium bromide, visualized by UV illumination. The intensities of the respective β-actin and c-jun bands were measured by densitometry using an Alpha Imager® and the software Image Tool®. Results were expressed as the ratio between c-jun values divided by those of the internal control β-actin and were the mean of three independent experiments. Supernatants from synoviocytes stimulated with cytokines were cultured and collected 72 hours after cytokine addition. Concentrations of OPG were measured with a sandwich ELISA using the set of specific antibodies and the OPG/Fc standard from R&D Systems as described elsewhere . MaxiSorp plates were coated overnight at 4°C with antihuman monoclonal OPG antibody (MAB8051). After several washings and saturation steps, diluted samples and serial dilutions of OPG/Fc standard (805-OS) were added and incubated for 1 hour at room temperature. After washings, the detecting biotinylated goat IgG anti-human OPG antibody (BAF805) was added for 1 hour at 37°C. Peroxidase-conjugated streptavidin (Jackson ImmunoResearch, West Grove, PA, USA) was then incubated for 20 min at room temperature. The peroxidase reaction was developed using orthophenylenediamine as a substrate and was stopped with 1 M sulfuric acid. The plates were read at 492 nm. The sensitivity of the assays was 40 pg/ml. Results are expressed as the mean ± standard deviation. Data were analyzed using the Kruskall–Wallis one-way analysis of variance test. P < 0.05 was considered statistically significant. We first tested the effect of IL-1β, TNF-α and IL-17 alone on RA synoviocytes to define the minimal and optimal concentrations able to induce nuclear translocation of the major TFs. A time course was performed and 30 min after the initiation of stimulation appeared to be a time point where most of the TFs were observed in the nucleus (data not shown). After 30 min of stimulation with increasing cytokine concentrations, cells were fixed and stained. The dose effect of each cytokine was evaluated by the measurement of the mean green intensity of the nuclear staining with image analysis software. The quantitative data are presented in Table 1. Results are compared with the condition using medium alone. After 30 min with cytokines at the cited concentrations, rheumatoid arthritis synoviocytes were fixed and immunofluorescence staining was performed. Nuclear translocation was confirmed by nuclear staining with Hoechst H33258. Using image analysis software, the mean green intensity of the nuclear staining was quantified in 10 randomly selected cells. Results are expressed as the mean of three independent experiments (mean ± standard deviation). The results were analyzed with the Kruskall-Wallis test. ***P < 0.001 versus medium, **P < 0.01 versus medium, *P < 0.05 versus medium, †nonsignificant. RA synoviocytes did not show any TF translocation without cytokine. With increasing concentrations of IL-1β, ranging from 0 to 500 pg/ml, C-Fos and C-Jun were found in the nucleus with concentrations from 100 to 500 pg/ml (P < 0.001 versus medium alone). NF-κB activation was more sensitive since a concentration as low as 10 pg/ml was sufficient (P < 0.01 versus medium). For IL-1β concentrations ranging from 0 to 500 pg/ml, no translocation was observed for Egr-1. Accordingly, an optimal concentration of 100 pg/ml IL-1β was chosen as a positive control for further experiments, while a suboptimal concentration of 10 pg/ml IL-1β had a weak effect only on NF-κB translocation. Similarly, with concentrations of TNF-α ranging from 0 to 500 pg/ml, C-Fos and C-Jun translocation was observed in the nucleus (P < 0.01 and P < 0.001, respectively). NF-κB nuclear localization was observed for the same concentrations (P < 0.001) while no Egr-1 translocation was observed. Accordingly, the optimal concentration of TNF-α was defined as 100 pg/ml. IL-17 activation was clearly less potent since concentrations of IL-17 as high as 100 ng/ml did not have an effect on C-Fos, C-Jun or Egr-1 nuclear translocation. These concentrations did, however, induce NF-κB translocation (P < 0.01 versus medium). Initial experiments were performed to establish the optimal conditions under which a first set of factors was activated. Additional experiments were performed to study the other members of the AP-1 complex. Fra-1, Fra-2, FosB, JunB and JunD nuclear translocation was evaluated after 30 min of cytokine addition at low and optimal concentrations (Table 1). As already observed for C-Fos, C-Jun, and NF-κB, 30 min of treatment with IL-1β (100 pg/ml) induced a nuclear translocation of FosB, Fra-1, Fra-2 and JunD (P < 0.001 versus medium alone), but not of JunB. Conversely, a concentration of 10 pg/ml IL-1β had no effect except on Fra-1 (P < 0.01) and on NF-κB (P < 0.01). TNF-α (100 pg/ml) induced a nuclear localization of FosB, Fra-1, JunB and JunD (P < 0.001 versus medium), but not of Fra-2. FosB activation was more sensitive to the effect of TNF-α, since a concentration as low as 10 pg/ml was sufficient to induce its translocation (P < 0.001 versus medium). IL-17 (100 ng/ml) had a weak effect on Fra-1 (P < 0.05) but not on FosB, on Fra-2, on JunB and on JunD. A concentration of 50 ng/ml IL-17 had no effect. IL-1β and TNF-α are mainly produced by monocytes while IL-17 is produced by T cells. To reproduce the interactions observed in the synovium, these three cytokines were combined at low concentrations, which may reflect the in vivo situation. Combined treatment with low concentrations of IL-1β and of TNF-α induced a nuclear translocation of all TFs except Egr-1 (Fig. 1). A synergistic effect was observed since the same low concentrations of IL-1β or TNF-α used alone had no effect. C-Jun was particularly sensitive to the effect of the combined treatment of IL-1β and TNF-α. Furthermore, an enhanced stimulation was observed for Fra-1 and NF-κB when compared with the effect observed with individual cytokines at low concentration. Figure 2 shows a representative experiment in which a nuclear localization of C-Jun was observed in most cells after stimulation with the combination of low concentrations of cytokines. Quantification of the effects of individual cytokines and their combinations on TF nuclear translocation. After 12 hours of culture without FCS, rheumatoid arthritis synoviocytes (104 cells/cm2) were stimulated for 30 min with cytokines at the cited concentrations. Immunofluorescence staining was performed with anti-TF specific antibodies and was confirmed by Hoechst H33258 staining. Using an image analysis software, the mean green intensity of nuclear staining was quantified in 10 randomly selected cells. Results are expressed as the mean of three independent experiments. Results were analyzed using the Kruskall–Wallis test. ***P < 0.001, **P < 0.01, *P < 0.05 versus medium alone. See Fig. 2 for an example of an actual picture. TNF, tumor necrosis factor. Effect of IL-1β, tumor necrosis factor alpha (TNF-α) and IL-17 used alone and in combination on C-Jun translocation. Rheumatoid arthritis synoviocytes were stimulated for 30 min with cytokines at the cited concentrations. Cells were fixed in 4% paraformadehyde and immunofluorescence staining was performed. Results are representative of three independent experiments. Effects of proinflammatory cytokines used alone at low and optimal concentrations and in combination on C-Jun nuclear translocation after 30 min of exposure are shown. IL-17 treatment in combination with TNF-α further induced the nuclear translocation of C-Fos, Fra-1, C-Jun and NF-κB. In the same way, combined treatment with low concentrations of IL-1β and of IL-17 showed a synergistic effect on the nuclear translocation of C-Fos, of FosB, of Fra-1, of Fra-2, of C-Jun, of JunD and of NF-κB. This combination had a particular effect on Fra-1 and NF-κB activation. The combination of the three cytokines was even more potent, leading to a synergistic effect on all of the TF translocations except for Egr-1. This IL-1β, TNF-α and IL-17 combination of cytokines had a particularly strong synergistic effect on the nuclear translocation of Fra-1, of C-Jun and of NF-κB. To determine whether these effects were related to an increase in translocation or in de novo synthesis we examined the mRNA expression, looking at whether it was particularly sensitive to a synergistic increase. The results for c-jun are shown as an example before and 20 min after cytokine treatment. At a suboptimal concentration of IL-1 (10 pg/ml) or TNF-α (10 pg/ml) c-jun mRNA expression was observed, whereas IL-17 (50 ng/ml) had no effect. These cytokines were then combined at these low concentrations (IL-1, 10 pg/ml; TNF-α, 10 pg/ml; IL-17, 50 ng/ml) with no effect or a low effect when used alone. Treatment with the combination of low concentrations of IL-1 and TNF-α induced an additive effect on mRNA expression of c-jun, whereas the combination of low concentrations of IL-17 with TNF-α had no effect on the TNF-α -induced expression of c-jun. In contrast, the combination of low concentrations of IL-1 with IL-17 induced a synergistic effect on IL-1 and induced c-jun mRNA expression. This picture was similar to the effect seen with the combination of IL-1, TNF-α and IL-17 (Fig. 3). Effects of IL-1β, tumor necrosis factor alpha (TNF-α) and IL-17 used alone and in combination on c-jun mRNA expression. After 12 hours of culture without FCS, rheumatoid arthritis fibroblast-like synoviocytes were stimulated for 20 min with individual or combined cytokines at low concentrations: IL-1 (10 pg/ml), TNF-α (10 pg/ml) and IL-17 (50 ng/ml). Cells were lyzed and total mRNA was extracted. RT-PCR was performed as described in Materials and methods. The intensity of the respective β-actin and c-jun bands was measured by densitometry. Results were expressed as the ratio between c-jun values divided by those of the internal control β-actin and were the mean of three independent experiments. CT, control. We selected OPG as a marker of effects at the protein level to look at a functional consequence of these interactions of cytokines. Supernatants from RA fibroblast-like synoviocytes were collected after 72 hours of culture following cytokine addition. Concentrations of OPG were measured by ELISA. In medium alone, RA synoviocytes produced 1 ng/ml OPG. The addition of IL-1 (10 pg/ml) doubled that production, whereas TNF-α (10 pg/ml) or IL-17 (50 ng/ml) had no effect (Fig. 4). The combination of IL-17 with IL-1 and, moreover, with TNF-α further increased that production, the effect being maximal when the three cytokines were combined. Determination of osteoprotegerin (OPG) levels in supernatants obtained from rheumatoid arthritis (RA) synoviocytes stimulated by proinflammatory cytokines alone or in combination. RA synoviocytes were cultured with cytokines at the cited concentrations. After 72 hours of culture, supernatants were collected and OPG levels were measured by ELISA. Results are expressed as the mean of three independent experiments. TNF, tumor necrosis factor. Proinflammatory cytokines play an important role in the pathogenesis of joint destruction and osteoporosis in RA. Nevertheless, the mode of activation of these ubiquitous TFs is poorly understood when interactions between these cytokines are considered. In this study, we investigated the nuclear translocation of AP-1 members, Egr-1 and NF-κB in RA synoviocytes after treatment with cytokines alone or in combination. The first part of the study extended previous reports on a limited number of transcriptional factors. At the same time, we have added results on IL-17 in addition to TNF-α and IL-1β. We also studied the functional consequences of cytokine treatment on OPG production by RA synoviocytes. The more interesting contribution is the demonstration of synergistic interactions between the cytokine-induced TF activation. It is important to consider that these results were observed at the protein level and at the mRNA level, suggesting that the observed effects are indeed functional. We obtained similar findings previously for the production of IL-6 [8, 17]. The TF AP-1 is constitutively activated in the RA synovium . Used alone at an optimal concentration, IL-1β and TNF-α induced the nuclear translocation of most of the AP-1 members, except JunB for IL-1β and except Fra-2 for TNF-α. Used alone at low concentrations, IL-1β induced a weak activation of Fra-1 and TNF-α induced an activation of FosB and Fra-1. The combination of these two cytokines at low concentrations induced the nuclear translocation of all the AP-1 members, with a particular effect on Fra-1 and C-Jun. NF-κB is expressed in RA synovial cells, and is further induced by treatment with TNF-α or with IL-1β . In our experiments, both IL-1β and TNF-α at high concentrations activated NF-κB nuclear translocation in RA synoviocytes. Used alone at a low concentration, IL-1β induced a weak activation of NF-κB. This effect was significantly increased in combination with a low concentration of TNF-α. Elevated levels of egr-1 mRNA have been described in RA synoviocytes . However, when used alone at optimal concentrations or in combination, IL-1β and TNF-α did not induce Egr-1 nuclear translocation. Opposite results have been reported where treatment with TNF-α or IL-1β induced egr-1 mRNA expression and Egr-1 nuclear translocation [19, 20]. Such a discrepancy is not clearly understood since the same antibody used here was previously able to detect Egr-1 in the nucleus of an osteoblastic cell line . Although there are elevated levels of IL-17 in synovial fluid of patients with RA, the pathogenic role of IL-17 in the development of RA remains to be elucidated . We therefore examined whether IL-17 alone could affect synoviocytes through mechanisms involving AP-1, NF-κB and Egr-1 pathways. Limited information is available on the effect of IL-17 on AP-1. Here, IL-17 alone had a weak effect compared with that of IL-1β or TNF-α. Indeed, IL-17 alone at a high concentration induced nuclear translocation only of Fra-1. In osteoarthritic chondrocytes, IL-17 was found to induce FosB and JunB . IL-17 at optimal concentration also had a weak effect on NF-κB translocation. The weak effect of IL-17 indicates that it has rather a regulatory effect, leading to the amplification of the action of other cytokines. T cells and monocytes are two major cell types involved in RA pathogenesis. Some of their derived cytokines may be present at very low concentrations in the RA joint, and their effects could then be significantly potentiated. Synergy between IL-17 and IL-1β or TNF-α was first described with RA synoviocytes  and later in myoblasts . IL-17 alone had a weak effect here yet, when associated with IL-1β and/or TNF-α at low concentrations, a synergistic effect was found for almost all of the TFs. Similarly, in myofibroblasts, IL-6 production was enhanced by IL-17 combined with IL-1β and TNF-α through an activation of NF-κB [23, 24]. 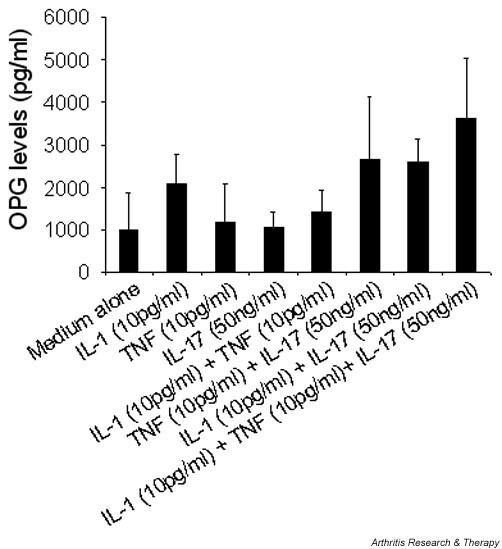 The effects of IL-17 with TNF-α were much stronger than those induced by IL-17 with IL-1β in these cells. Moreover, the combination of IL-17 and IL-1β further increased C-Fos, C-Jun and NF-κB activation . Conversely, in RA synoviocytes, we found a higher effect of the combination of IL-17 with IL-1β than with TNF-α. The strongest effect was observed for the combination of the three proinflammatory cytokines. Even more interesting is the fact that some factors not activated by individual cytokine treatment were stimulated with their combination. Fra-1 and NF-κB were particularly sensitive to this effect, suggesting that these TFs are important mediators of IL-1β, TNF-α and IL-17 signaling pathways in vivo. In a previous study, such a combination at low concentrations was able to promote the nuclear translocation of NF-κB in the osteoblastic cell line ROS 17/2.8, also with a major synergistic effect . To differentiate between an increase in translocation or in protein synthesis, we looked at the mRNA expression using the same cytokine combination. Induction of c-jun mRNA expression was induced by IL-1 or TNF-α used alone, as previously described for c-fos and c-jun mRNA levels in fibroblasts [25–27]. At these low concentrations the two cytokines had a weak effect when used alone but their combination showed an additive effect, with IL-17 alone having no effect. A synergistic effect was observed particularly when the three cytokines were combined. To extend these findings to the protein level, we looked at levels of OPG in supernatants obtained from RA synoviocytes stimulated with the same cytokine combination [16, 28]. Elevated levels of OPG were found in synovial fluid and in serum from RA patients when compared with controls [16, 29]. IL-1 and TNF-α are known inducers of OPG production in cultured synoviocytes [16, 30], in periodontal ligament cells and in pulp cells . Similar results were observed with vascular endothelial cells regarding RANK-L and OPG expression . OPG mRNA levels in MG-63 osteoblastic cells increased in a dose-dependent and time-dependent manner after IL-1 and TNF treatment [33, 34]. In the collagen arthritis model, overexpression of IL-17 not only enhanced RANK-L expression, but also strongly upregulated the RANK-L/OPG ratio in the synovium . Here we show the lack of effect of IL-17 alone, contrasting with the increase in OPG levels after IL-17 treatment when combined with IL-1 and/or TNF-α. In contrast, the combination of IL-1 with TNF-α had no effect. Since OPG is a negative regulator of RANK-RANK-L interaction, this effect of cytokines may represent a feedback loop to control bone destruction. Since IL-1β and TNF-α are the key mediators in RA, their control represents a major therapeutic goal. Data from clinical trials showed clear efficacy, but also revealed that blockade of these cytokines did not fully control arthritis in all patients. Our study demonstrated the potency of cytokine combination at low concentrations. Accordingly, combination therapy acting on more than one cytokine may contribute to a better effect. The basis for such a concept has already been obtained with ex vivo models of RA-associated joint inflammation and destruction . Controlling the T-cell-derived cytokine IL-17 and either IL-1β or TNF-α appears more critical than the combined inhibition of IL-1β and TNF-α. Since AP-1 and NF-κB are common pathways for these cytokines, neutralizing these TFs directly or by acting on their upstream kinases may have an increased effect when compared with a single cytokine inhibition. These findings indicate that interactions between cytokines have to be considered, regarding their mode of action and their contribution to disease. In conditions where individual cytokines had no significant effect, their combination resulted in a dramatic induction of TFs. Conversely, removal of this contribution with a single inhibitor may lead to a profound reduction of activation. This concept may explain both the impressive effect of cytokine inhibitors in many RA patients as well as their failure in a subset of these patients. Supported in part by a grant from l'Association de Recherche sur la Polyarthrite.